Murad Says - "Instantly magnify, refresh and set with this translucent, liquid blotting formula in an on-the-go cushion compact for 8am skin - all day." "Soft focus mattifying spheres absorb oil, minimise pores and perfect skin." "Set makeup, touch-up throughout the day or use on bare skin for a natural, matte look - cooling, antimicrobial applicator won't disturb makeup." It's been a while since I've featured something from Murad on here and over the past couple of months, I've been trialling the Murad MattEffect Blotting Perfect & Mattifying Primer which is a product unlike anything else on the market - and that's what makes me love what I do! I love being able to work with brands and discover products I wouldn't normally come across and it makes me really happy that I can share these products (and brands) with all you lovely readers too. As you can see, the packaging is really simple - there's nothing over the top but that's what makes it beautiful. 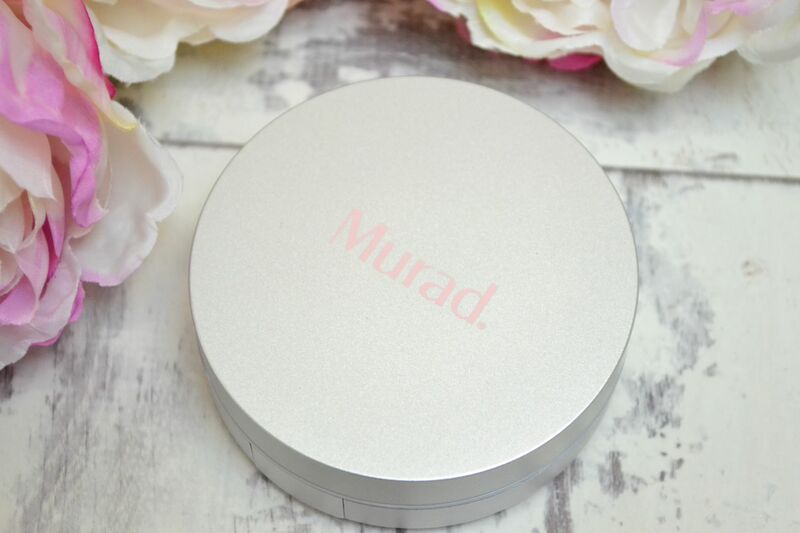 I love the silver packaging which has been teamed up with the complimenting baby pink Murad logo - this is actually the same colour of the sponge / product inside which is really cute! What I love about this is that it reminds me of old-school makeup - in a good way. Think of older translucent powders and compacts which always had a sponge to apply - nowadays we have so many different options however going back to basics is always a good thing! The applicator itself is antimicrobial and will NOT disturb your makeup in the process of setting. As you can see in the image - there's a sponge with the translucent liquid formula which not only prepares your skin for makeup but also absorbs oils during the day. With soft-focus mattifying spheres and marshmallow powder - this leaves your skin beautifully matte, soft and smooth. Here you can shop the item from the official Murad website. Overall, this is a wonderful product to add to your beauty collection as it's unique and unlike anything else you've used. The formula has been developed to apply on your skin before AND after applying makeup to ensure your skin looks fabulous all day long. For me, this has been a go-to across summer as I love the cooling effect and how soft my skin feels plus - it helps any 'shine zones' such as the T-zone or nose. I'd love to know what you think of the Murad MattEffect Mattifying Perfector - have you used this (or anything else from Murad) and if so what did you think...? Have a lovely day and there's a new post coming soon! Thanks so much for your detailed review, I really like the sound of it! These products look promising. Informative review you got there.